The producers of 'No Man’s Land' openly noise about the film’s Wild West roots and its 'Mad Max' visuals, but thankfully it’s a lot more fun than that. Design aside, Ning Hao’s movie runs more like a French farce, with events of increasing coincidence and physicality bringing a character to their knees. Xu Zheng plays one of the most smug lawyers ever committed to film, a bigshot from the city hired by a falcon poacher to defend his murder of a policeman. In a small town past the Gobi desert, the lawyer gets him off the hook, but has to take the poacher’s car as collateral. 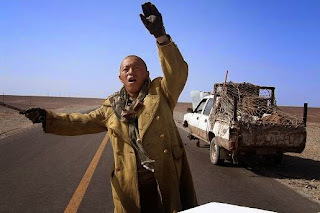 The poacher gets his partner in crime to chase Zheng through the desert and kill him. Along the way, Zheng is bullied by two workmen in a truck and accidentally over-retaliates by setting their truck on fire. There follows two hours of progressive absurdity, leading to a full gun-toting showdown. The spiteful coincidences are written plausibly for a film with so much other weirdness in it, and while it’s populated with outlandish characters, they only become that way under the strain of frustration. Yu Nan is particularly funny as the dancer that Zheng inadvertently ends up trying to protect, a woman hyper-aware of being in over her head. It’s taken a long time for 'No Man’s Land' to get to us. Censorship issues in China delayed the release of footage that was originally shot in 2009, and it took a further year to get from the Berlin festival to London. But it’s admirable that rather moving to somewhere like Hong Kong where he could make movies free from political restraint, Hao refuses to abandon his home to censorship and continues to challenge the traditional Chinese movie industry with such funny and dark features. 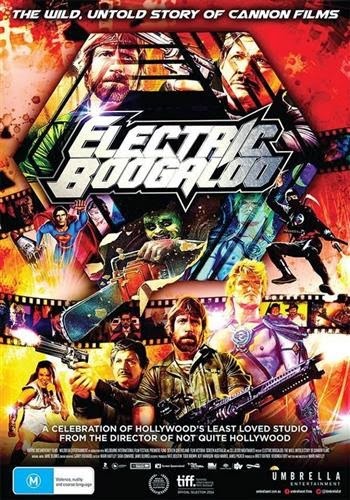 'Electric Boogaloo' is a documentary about movies - which is really the only way to discuss the history or technique of cinema effectively. 'Mark Cousins’ The Story Of Film', while an entertaining and informative book, was never so clear and evocative as when he turned it into a documentary series. How do you talk specifically about a film if you can’t show something from the film? Mark Hartley directs a history of The Cannon Group, a small, practically penniless studio bought out by Menahem Golan, a prolific Israeli director, and his cousin and film producer Yoram Globus. They applied their ‘anything goes’ production style and fanaticism to the American scene, turning out a staggering number of B-movies throughout the 80s before attempting a move into the mainstream in the early 90s. Although they were something of a running industry joke at the time, Cannon came to define the hammy 80s films that echo in the hearts of a minority of adults today, including me. Movies like 'Lifeforce', 'Masters Of The Universe', and the 'Death Wish' sequels are all really, really awful, but if they caught you at the right time when you were a kid you would love them all the same. Aside from the cultural influence, Cannon also coloured the business practises of Hollywood. Golan and Globus were notorious for turning up at international festivals in a huge show of wealth and ceremony, then selling distribution rights to companies based solely on the posters of movies that hadn’t been written yet. Golan would sometimes make up a plot on the fly while looking at the poster during these meetings, and distribution companies would buy the rights on the strength of his salesmanship. This allowed Cannon to use the money to retroactively churn the film out and deliver it. Ultimately, and predictably, the same financial overreaching that made the studio also wrecked it. Hartley’s history seems to have been filmed with the pace of a Cannon movie in mind - there are no moments when the backing soundtrack lets up, talking heads aren’t enough, they have to cut between them fast and regularly, and often clips play inserted beside the interviews. The content is present, but not structured in a way that easily locates the viewer in the arc of Cannon’s history - we’re presented with a string of production stories that are all interesting, but they don’t often elucidate the bigger picture. There’s no sense that the people involved in Cannon were progressing or changing, although maybe the criticism is unfair because by all accounts they may not have changed still. Among the hyperactive repetition, glorification and mythologisation, however, we see a vibrant portrait of two men who had absolutely no idea what they were doing. They didn’t know which movies were going to work and which weren’t, but they produced so much so fast that some of them inevitably made a dent in the public consciousness. The studio became half the spectacle, much in the same way as their contemporaries at Troma, or Platinum Dunes today. 'Electric Boogaloo' is a very entertaining slice of movie history, but the emphasis is much more on the entertainment than the history. As I guess it should be. 'No Man's Land' and 'Electric Boogaloo: The Wild, Untold Story Of Cannon Films' screened at the 58th BFI London Film Festival.